General picture of Hall Effect Sensors Magnetic Field Sensors as Hall effect sensor is a sensor used to detect the magnetic field. 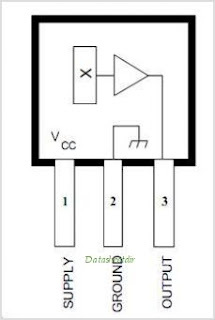 Hall Effect sensor will produce a voltage proportional to the magnetic field strength received by a Hall effect sensor tersebut.Sensor it only consists of a silicon layer and two electrodes on each side of the silicon. By the time without any influence of the magnetic field then the potential difference between the two electrodes is 0 Volt as an electric current flowing in the middle two electrodes. When there is a magnetic field affecting the sensor is the current that flows will turn close to / away from the side that is affected by magnetic fields. This results in a potential difference between the two electrodes of Hall effect sensors, where the potential difference is proportional to the magnetic field received by the hall effect sensor. Pin 3: Vout, the output voltage pin. In this sensor already built an amplifier that strengthens the signal from the sensor circuit and produce the output voltage in the middle of the supply voltage. In this sensor if it gets the influence of magnetic field polarity of the north pole it would result in a reduction in the output voltage on the contrary, if there is the influence of magnetic field polarity of the south pole it will result in an increase in the output voltage. This sensor can respond to changes in magnetic field strength from a static magnetic field strength and the strength of the magnetic field varies with frequency up to 20kHz. 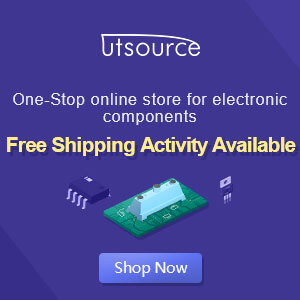 UGN3503 hall effect sensor has a wide supply voltage is from 4.5V to 6V to the sensitivity of changes in magnetic field strength up to 23KHz frequency. The core of this system is the sensor UGN3503U. This sensor will produce output voltage 3V in the absence of magnetic field influence on the sensor. 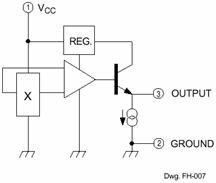 Tegagnan output is not strong enough so that it still needed an op amp is used to amplify the signal from the sensor changes UGN3503U.